James K. Baxter was not a man of few words, and his private correspondence was no exception. 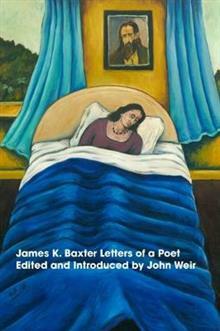 Letters of a Poet, edited by his good friend and frequent correspondent John Weir, contains almost 900 of Baxter's letters from 1939 to 1972, covering his teenage years and entire adult life. Frank, funny, generous, sometimes filthy, packed with poems and musings on love, the Catholic faith, and how to live well and write well, they provide remarkable new insights into his life and work. Includes letters to his parents, Archibald and Millicent Baxter, the conscientious objector Noel Ginn, and many of the leading literary figures of the time, including Charles Brasch, Allen Curnow, Frank Sargeson, Fleur Adcock, Lawrence Baigent, Barry Crump, Maurice Shadbolt, W. H. Oliver, Robin Dudding and many more. Includes introduction by John Weir, biographies of correspondents, timeline and index. John Weir was born in Nelson in 1935. After a period of training at Mount St. Mary's Seminary, Greenmeadows, he was ordained a Catholic priest. He has published poetry, bibliographies and critical monographs and edited a number of collections of James K. Baxter's poetry, including his Collected Poems and Complete Prose.